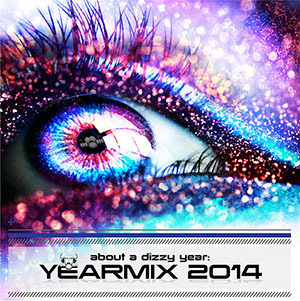 The 15th yearmix: about a dizzy year: YEARMIX 2014. Containing only the best dancetracks from 2014. Starting at 117 BPM and ending 132 bpm. For the selection of these tracks I used The Dutch Dance List again. I spent over 105 hours for mixing en several hours for preperation and mastering. The mix contains 83 tracks and the total playing time is 57:20 plus an outro. I dedicate this mix to my sons Falco & Lindo. The Video is made by kozmikdj. Send him credits too! Thnx kozmikdj for the awesome coöperation and result. Please send me an email if you want to broadcast my Yearmix. If there is some information not right or incompleet, then let me know by email. 24-11-2014: 80 hrs, 60 tracks, playing time 40 mins. 26-11-2014: 85 hrs, 64 tracks, playing time 43 mins. 3-12-2014: after 105 hours mixing the mix is ready. 85 tracks and 57:20 playing time.